Week 9 Raiders @ Steelers Preview and Prediction | "IT'S A STEELERS WORLD"! Isn’t it time? Seriously, isn’t it time to wipe that smug looks off of their Silver & Black faces? Because me being one of hundreds of thousands Black & Gold faithfuls think it is that time. The Oakland Raiders ride a winning streak into Heinz Field this Sunday to do battle on the “Field of Green” against the Pittsburgh Steelers. In a game most have considered to be over the last couple of games a “trap”. A trap because when the Steelers assumed that the Raiders could easily be beat..the tables were turned and in fact, the Steelers got beat. On September 23rd, 2012 the Steelers fell to the Raiders 34-31..and then again on October 27th, 2013..Oakland 21 Steelers 18. Both games lost by a total of 3 points, both games I attended and the Steelers could have easily won. The last time Pittsburgh beat Oakland was a November 11th 35-3 blowout, which bodes well towards saying that November may be the Steelers lucky month against their hated AFC West rivals. Pittsburgh quarterback, Ben Roethlisberger coming off of a less than stellar return game outing against the Cincinnati Patriots last Sunday in a 16-10 loss. And yes, I am very aware that I called Cinci the Pats, because any team that uses cell phones on the sidelines should be noted as such. 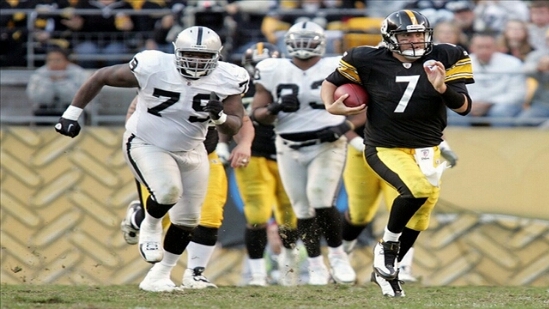 Roethlisberger, went 28 of 45 for 262 yards with a touchdown, three interceptions and three sacks. In addition to falling to .500, the Steelers lost running back Le’Veon Bell indefinitely to a knee injury. Bell twisted his right knee beneath him as he was tackled in the second quarter and had to be carted off the field. Later evaluated as a badly torn MCL. That’s not to say that DeAngelo Williams is not able to carry the load, doing so in Bell’s absent the first two games he missed due to a suspension. The question is..”can newly acquired running back, Isaiah Pead carty Williams’ backup baggage”? My answer to that is an emphatic “no”..but he will carry as much as needed from coach Mike Tomlin, offensive coordinator Todd Haley and the Steelers offense. Which I believe will be minimal. Although the Oakland Raiders have come off with some impressive wins, and quarterback Derek Carr has put together the best back-to-back games of his career _ 47 of 67 for 622 yards, seven touchdowns and zero interceptions..he has yet to play against the Steelers defense. A Steelers defense who not only kept Cincinnati out of the end zone during the entire first half of last week’s game, but a Steelers defense who is destined to prove their worth..and extremely hungry. I see Carr receiving a very heavy dose of blitzes from James Harrison and rookie, Bud Dupree all day long. Basically knocking Carr off of his seemingly unflappable game is the key to victory. That, along with Roethlisberger having knocked off all the rust last week, and still obtaining the most dangerous receiving corps in the National Football League in Antonio Brown, Martavis Bryant, Markus Wheaton, Heath Miller and former Raider Darrius Heyward-Bey the Steelers should pass their way to a victory. Not going in depth on statistics, because as we all know statistics usually don’t mean crap..just going off a pure gut feeling.